This is not a drill: An amazing and adorable hedgehog cafe is open in Tokyo. That's right: You know those cat cafes you see popping up everywhere and how happy everyone looks sipping lattes and petting cats while sitting on chic couches? Now, if you're lucky enough to be able to travel to Tokyo, you can have the same experience... except with hedgehogs. The hedgehog cafe goes by the name "Harry," which is a play on the animal's name in Japanese, "harinezumi." Inside Harry, you'll see between 20 and 30 hedgehogs of different breeds and sizes hanging out inside glass tanks. You're allowed to (gently) hold and cuddle the hedgehogs, which, yes, sound like a dream come true for selfies. Interestingly, Tokyo has a pretty impressive list of animal-themed cafes already available: You can visit hawk cafes, snake cafes, owl cafes, goat cafes, and rabbit cafes, all of which make cat cafes seem adorably blassé. Adding hedgehogs to the lineup makes sense in Tokyo's context, though, because hedgehogs are actually common household pets in Japan. They read as much less exotic to the locals than, say, the thrill of the owl cafe. Since the hedgehog cafe opened in February of this year, Harry has been busy, with customers often having to wait in line to enter, staffer Mizuki Murata told NBC News. This doesn't surprise me at all, because if I were within 100 miles of this place, I'd go to there as often as I possibly could. The cost to enter the hedgehog cafe is 1,000 yen (about $9 in U.S. currency) during the week, and goes up slightly to 1,300 yen (about $12) on the weekends. I would gladly forgo my weekend coffee splurge to justify a trip to Harry... though the cost of an international flight to Japan might be a little tougher to pull off. 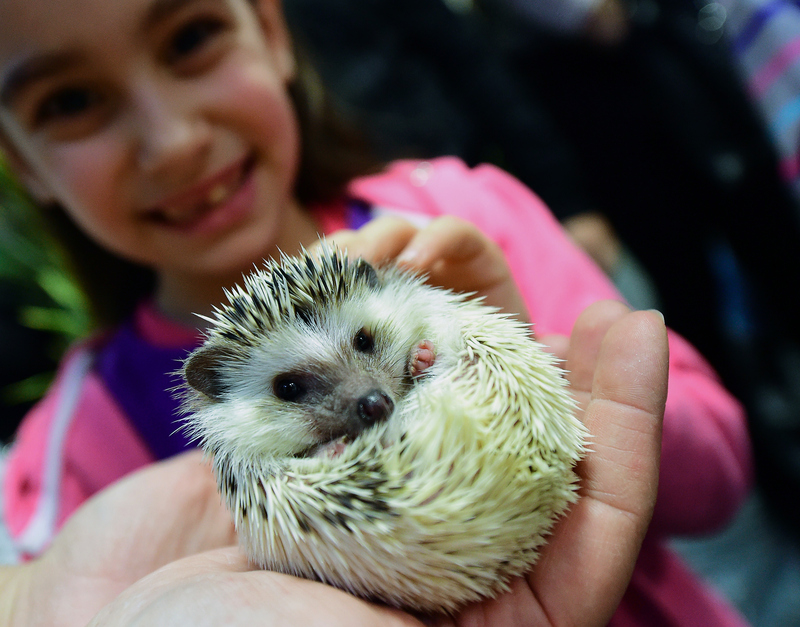 Murata also told NBC News that the main goal behind the hedgehog cafe is to show people that the little critters are nothing to be afraid of, in spite of their reputation for being spikey. She explained, "We wanted to show people the charm of hedgehogs, which give the impression of being hard to handle. We wanted to get rid of that image by letting people touch them." This makes sense; I've never actually held a hedgehog myself, but I have a feeling I would want to cuddle all 30 of them if given the opportunity. While it doesn't appear that this cafe serves food or drink, I'm more than OK with forgoing a traditional coffee and cookie treat in order to (gently) squeeze these little critters for the better part of an hour.